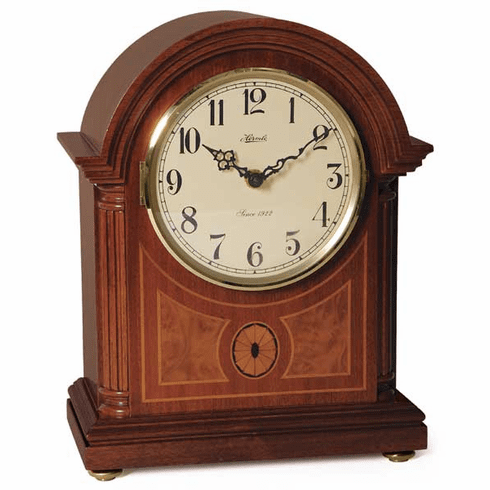 Elegant barrister style mantel clock made from select hardwoods and veneers in a rich mahogany finish. The front panel features fluted columns and exquisite inlaid marquetry. Behind the brass bezel and convex glass lens is an ivory colored dial with Arabic numerals and metal serpentine hands. Plays 3 melodies: Westminster, Ave Maria and Bim Bam. Features volume control, personalized night shut-off and quarter hour chime with full hour strike. Requires 2 "C" batteries (not included). Dimensions: H: 11-5/8", W: 9-1/4", D: 5-1/8"